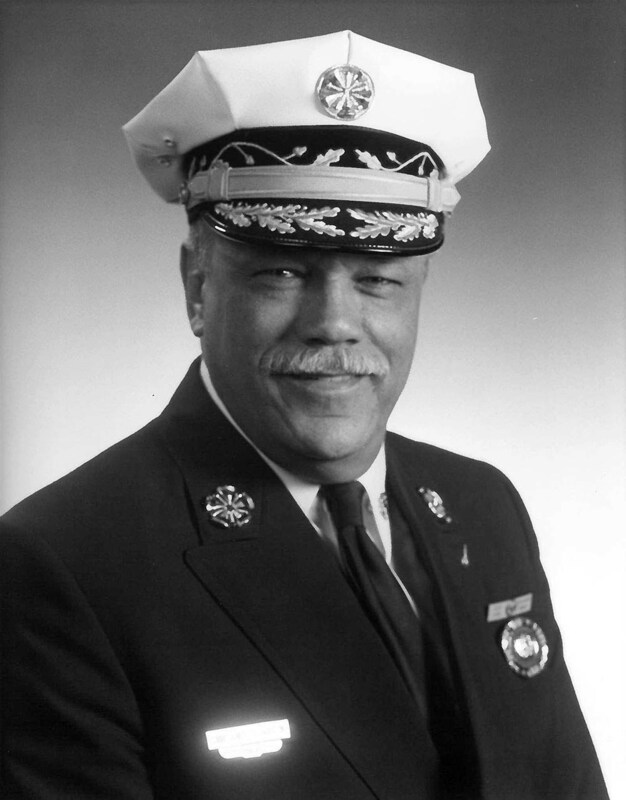 Harold Hairston served as the first African American Fire Commissioner for the city of Philadelphia, Pennsylvania. Hairston was born in North Carolina. Not much is known about his early life. He joined the Army in 1960, and served for three years with the 82nd Airborne Division. During part of his time in the Army Hairston was a Weapons Instructor at West Point Military Academy, in West Point, New York. Following his discharge, he moved to Philadelphia, Pennsylvania, and joined the Fire Department, Ladder Company #11, in 1964. Hariston was promoted to Fire Lieutenant in 1971, and Captain in 1978. He received two citations in his career for life saving rescues. The first came in 1980, for running into a building to save a one-year old child while wearing no breathing apparatus and without any backup. Hairston was then promoted to Battalion Chief in 1981 and then Deputy Chief in 1986. He started the Fire Prevention essay contest with the school systems in 1992, and in 1995 began the residential fire inspection program. In 1992, Hairston became the first African American to become Fire Chief in Philadelphia, leading a department of about 2,500 men and women, then the nation’s fifth largest fire department. He was appointed by then Mayor Ed Rendell. Response times became quicker and the number of people killed in house fires declined during Hairston’s tenure as head of the Fire Department. In 2003, Hairston was named Fire Chief of the Year in 2003 by the Metropolitan Fire Chiefs Association, and Fire Official of the year by the National Burglar Alarm Association. He retired in 2004, ending his forty year career with the city. After his retirement, Hairston worked for the Channel 6 CBS Eyewitness News Team as a consultant for public safety and for the Philadelphia Fire Department. He served on several boards including the American Red Cross of Southeastern Pennsylvania, the Dad Vail Regatta Association, the Police Athletic League, the Variety Club of the Delaware Valley, and the Delaware Valley Burn Victim Foundation. The was also a member of the Valiants, a fraternal organization of Latino\a and African American firefighters and the International Association of Black Professional Firefighters (IABPFF). Harold B. Hairston died on November 1, 2016 at his home in Philadelphia, Pennsylvania, at the age of 76. He is survived by his wife Anne, and their three children. A tribute to Hairston’s memory was erected in the Fireman’s Hall Museum in Philadelphia, Pennsylvania in 2017. Stephanie Farr, “We followed in his footsteps; Harold B. Hairston, Philadelphia's first African American fire commissioner, is laid to rest,” Philly.com, November 4, 2016 http://www.philly.com/philly/news/20161111__We_followed_in_his_footsteps__Harold_B__Hairston__Philadelphia_s_first_African-American_firefighter__is_laid_to_rest.html; Ayana Jones, “Harold B. Hairston, 76, Philly's first Black fire commissioner,” Phillytrib.com, November 2, 2016, http://www.phillytrib.com/news/harold-b-hairston-philly-s-first-black-fire-commissioner/article_1ed0c49a-c4db-550f-8880-b9fdb2e6ab25.html; Robert Moran, “Former Philly Fire Commissioner Hairston Dies,” Firehouse.com, November 3, 2016, https://www.firehouse.com/careers-education/news/12275931/former-philly-fire-commissioner-hairston-dies-at-76-firefighter-news. Stephanie Farr, “We followed in his footsteps; Harold B. Hairston, Philadelphia’s first African American fire commissioner, is laid to rest,” Philly.com, November 4, 2016 http://www.philly.com/philly/news/20161111__We_followed_in_his_footsteps__Harold_B__Hairston__Philadelphia_s_first_African-American_firefighter__is_laid_to_rest.html; Ayana Jones, “Harold B. Hairston, 76, Philly’s first Black fire commissioner,” Phillytrib.com, November 2, 2016, http://www.phillytrib.com/news/harold-b-hairston-philly-s-first-black-fire-commissioner/article_1ed0c49a-c4db-550f-8880-b9fdb2e6ab25.html; Robert Moran, “Former Philly Fire Commissioner Hairston Dies,” Firehouse.com, November 3, 2016, https://www.firehouse.com/careers-education/news/12275931/former-philly-fire-commissioner-hairston-dies-at-76-firefighter-news.